Yesterday reader Aaron Schiff published this post looking at how population had changed across the country and compared it to how it had changed for the 20-34 age group. Young adults represent the future of New Zealand’s economy, so I think it’s interesting to look at what is happening to them over time. 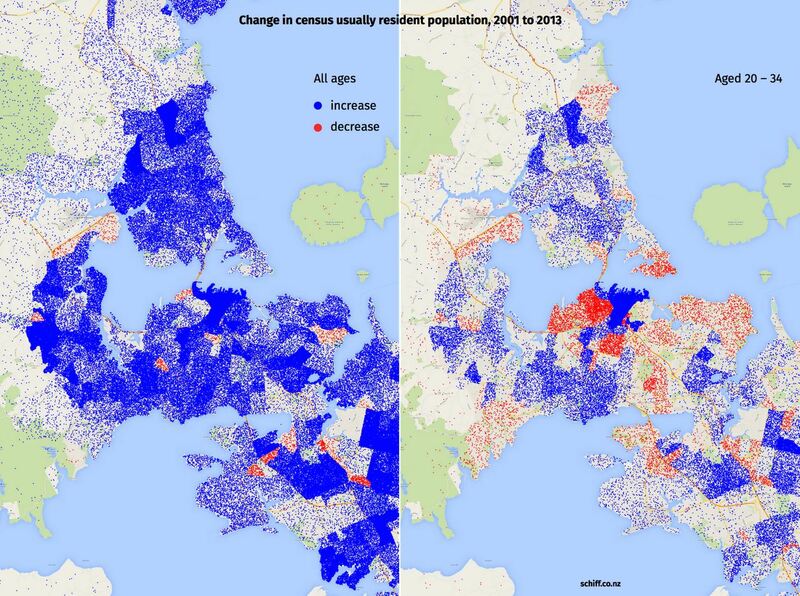 Using Census data I’ve made some dotmaps of population changes between 2013 and 2001. In the following maps, there is one blue dot for each new person in census area units that experienced population growth over this time, and one red dot for each person lost in areas where the population shrank. In each case the maps compare changes in the total “census usually resident” population with that of young adults aged 20 to 34. People in this age group are generally finishing up education, entering the workforce, starting families, and buying houses. The maps show changes in where people live, which reflects a number of factors including earning prospects and cost of living (among other things). First, the national picture. Total population increased in all of the major cities, most smaller centres, and many rural areas too. In comparison the increase in young population is more concentrated on urban centres. 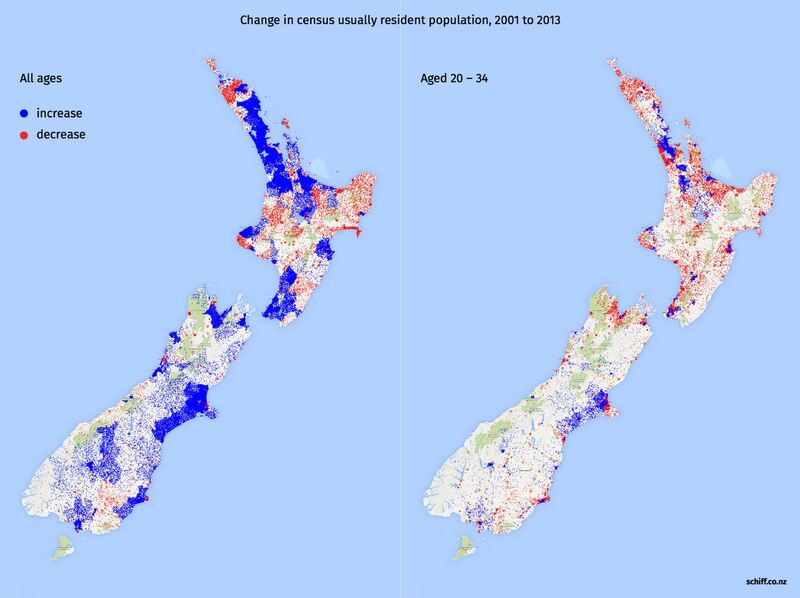 In the Auckland region, total population increased in almost all areas. The changes in young adult population are very different – a big increase in the CBD but reductions in many areas surrounding the CBD, and growth in outlying areas. I would hypothesise that this reflects housing costs more than anything. The areas just to the west of the CBD (Freeman’s Bay, Ponsonby, etc) are especially interesting. The total population in these areas grew very little between 2001 and 2013, while the young adult population reduced significantly. Firstly I’m surprised that some areas have had overall population losses, some like around Glen Innes might be related to a smaller population while Housing NZ start to redevelop their land, something that will almost certainly see the population jump over time. Other areas like that experienced population loss like Herne Bay might be more related to houses being lived in by (wealthier) older couples whose children have left home. House price rises that have put home ownership out of reach for many younger people in these areas. As to where the growth in young people has been happening, it’s been incredibly strong in the CBD which reflects the growing number of students who are choosing to live more urban. Crazy that there’s been basically no growth whatsoever in Grey Lynn and Ponsonby over that 12 year period. NIMBYs have been too bloody effective. Is the Grey Lynn/Ponsonby decrease due to NIMBYs or just to the fact that house prices are over $1 million dollars and these suburbs have lost there Polynesian and students populations? Both. NIMBYS [go Bernard!] are preventing any new dwellings for people that can afford to live there [new apartments and terrace houses], and the more intensively occupied use of the existing housing stock of the recent past, big families and student flats, are being/have been replaced by older singles, couples, or families with younger children. Net loss of young adults who clearly can’t afford these suburbs as they are currently tightly controlled. Herne Bay is hilarious, I can remember when that was full of student flats; villas chopped into four for example. They’ve now been done up or replaced and occupied by one very thin woman, three annoying dogs and about six german SUVs. The ex-husband has another one up the road; the kids are somewhere in between. Plenty of work for shrinks and gardeners. And One Tree Hill, Onehunga, and even Mangere are showing signs of beginning to get on this pattern too! And the big gainer for the young adult cohort is the Centre of the City. Apartments. Ooooh, that was good. Cruel, but I see the point under the hyperbole. I grew up in Point Chevalier at the time when families were probably just starting to move in and displace the traditional pensioner population up till the 1970s and 1980s. Sometime around 1995-2000 just about everybody seemed to be adding an extra storey to their house (probably when the kids, like me, were reaching their teens). I suspect lots of those houses are a bit emptier now, but the cars on the street are generally a hell of a lot flasher and the place is generally developing that affluent sleepiness I associate with Devonport or Herne Bay. With property values in the area skyrocketing, I wonder where it will all eventually get to. Seriously, we lived there for a while, when my kids said they at some other kid’s place we had to ask which one; the mum or the dad’s?…..It’s lovely, and deadly boring; never again. Everyone was fine but sort of anethetised. By wealth. Have to laugh at that one, but too true. Funny thing is that where I currently live (Forrest Hill/Milford) it looks like some interesting change occurring. Used to be famous as an haven for the elderly with lots of little B&T flats, and bunches of mobility scooters down in the shopper centre. More recently, seems to be families like ours have been moving into the area for the schools (Westlake/Carmel). So population demographics are changing but very apparent that there are some sharpish edges to the suburbs, and that closer to the waterfront, the young people are priced out or simply don’t want to live there. Hope to see some more intensive developments in Milford over the next few years which will help the area develop some life. How is this mapped exactly? I note it shows massive population boosts at Auckland Airport, Puketutu Island, Pukaki Crater and Otuataua Stonfields where all of zero people actually live. Areas include things like parks etc and have dots randomly assigned for each person change per mess block, they aren’t exactly on the dwelling where the individual lives. Does make for some odd dot placements! Indeed, I wish I had better information to help with dot placement. Look at the overall pattern, not any individual dot. Simple if not straightforward hack: I wonder if you could apportion the dots to the overall population figures for each meshblock within the area unit: say you need to put N dots in an area unit with population PA, then a given meshblock with population PM should have (PM / PA) * N dots in it. Probably reasonable for total population, not so much for the young population, as the ratio to total population might be different for different meshblocks in an area unit. I did wonder about the dots appearing on Meola Reef and at the tip of Coyle Park. Hobbitses? Looks like Census Area Units, which are fairly large – a few thousand people each. Do meshblocks not have the age breakdown of population, maybe? Hi Steve, I wanted to do the analysis at the meshblock level but unfortunately too much of the population by age group data is censored at that level, so I had to use the larger census area units. That and the random assignment of dots explains why they are in parks, on the airport, Rangitoto, etc. Cool maps! Also a good example of the modifiable areal unit problem, where the color/density of dots in an area could be completely different if the boundaries are slightly adjusted. Huge potential in this area with two railway stations, but mostly zoned Single House and Mixed Suburban in the PAUP. Great maps. 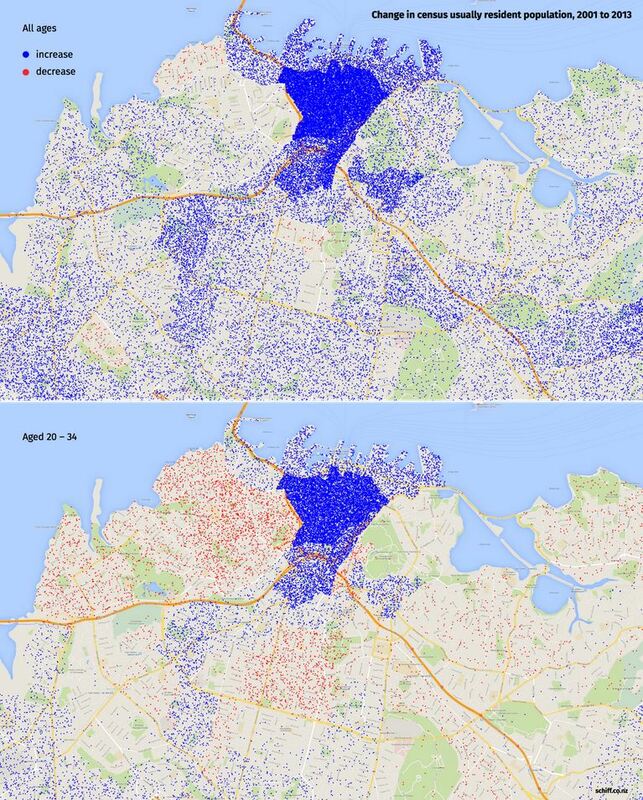 Don’t suppose you could do similar maps for households without cars ? They could pick up not just the poorer suburbs, but the successful communities like Browns Bay and Orewa that older people gravitate to. Would be useful for Unitary Plan evidence. Aaron for your Christchurch maps could you make a bigger Canterbury map similar to your Wellington map that included the satellite towns of Rangiora, Kaiapoi, Pegasus, Rolleston, Prebbleton, Lincoln etc. Because these are areas of large growth and it would be interesting to see what age groups moved where. This has now been put up at the Herald’s Datablog: http://www.nzherald.co.nz/data-blog/news/article.cfm?c_id=1503710&objectid=11349347 ; linked and discussed by Russell Brown at Public Address here: http://publicaddress.net/hardnews/the-uncooling-of-the-inner-west/ .